Everyone knows that k-cups are one of the most convenient ways to enjoy a cup of coffee, but there are plenty of k-cups out there that allow you to brew tea easily, as well. It is a bit faster than waiting for tea to steep and they give you an alternative to coffee in places like hotels and offices where Keurig machines are staples. That said, I primarily brew loose leaf or bagged tea at home and don’t usually buy too many tea k-cups. 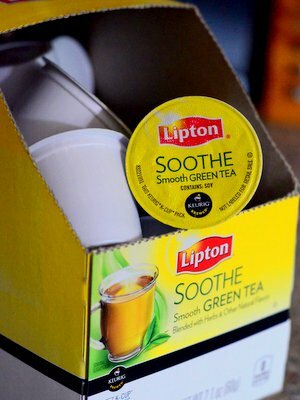 A friend of mine recently gave me a box of Lipton’s Soothe Green Tea K-Cups to try, saying that they were a new favorite in his house. From the name, you might think that this tea is nothing more than a straightforward green tea, but the tea is actually quite complex and surprisingly delicious. These k-cups contain a blend of green tea, chamomile, lemon verbena, spearmint, peppermint, rosehips, orange peel, hibiscus, lemon grass, orange and chicory. Chamomile is fairly strong and it really works well with the green tea to give you a very balanced base that is not too heavily weighted towards the green or the chamomile. The green tea helps to mute the usually strong flavor of the chamomile and soften it. You get notes of orange, lemon, mint and rose, for a tea that is extremely soothing and without any one flavor jumping out. It’s good on its own and it is delicious with a little bit of honey or sugar. This tea is ideal for bedtime or those days when you might be feeling a little under the weather – and since those are two times when you probably don’t want to work too hard to make your tea, k-cups are a perfect solution.